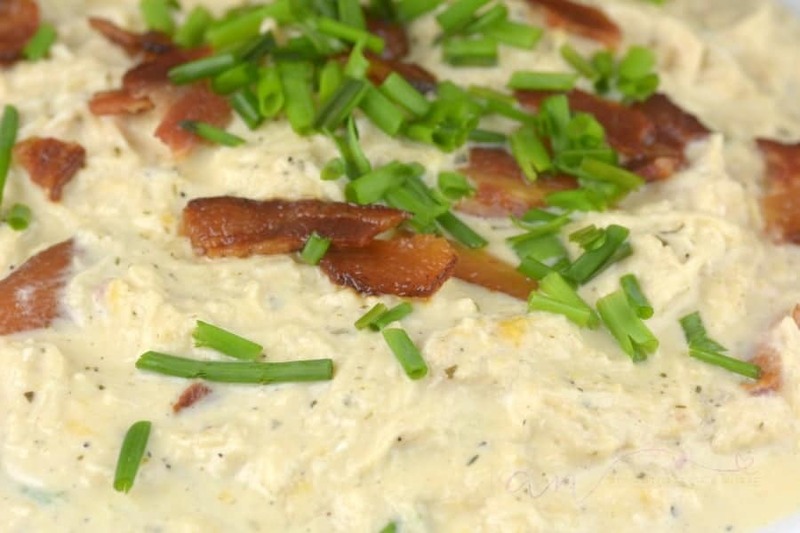 Ranch, cheese, bacon, and chicken all in one dish who could ask for more? I hope you enjoy this as much as I did. Please check out my 20 MUST HAVE Instant pot recipes. Serve up this rich, creamy, and highly addictive Instant Pot Crack Chicken tonight! This Instant Pot recipe is one of the most popular recipes on my blog to date, and for good reason. 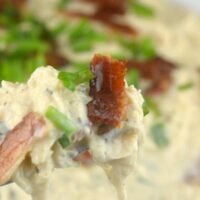 Creamy, cheesy, salty bacon, ranch, and tender chicken all in one dish! Who could ask for more? I will be honest I tend to get in a dinner rut. I stick to a handful of recipes, get burned out and then am left scratching my head. One of the recipes I have now added to the rotation is my crack chicken. It is the perfect bold and vibrant dish that helps me get energized about dinner time. My husband gets excited, and we both gobble it right up. We love crack chicken so much I have made it in a variety of ways. If you are like me and want to branch out to more recipe ideas, here are our tried and true. Are you seeing a theme here? This mix of ranch, cheese, chicken, are what is going to win over everyone at your dinner table. Even picky eaters. The biggest question is what is crack chicken. Well, crack chicken is a name for some of the most addictive chicken you will find. The flavors work together to mean it is almost as addictive as crack. It is kind of the running joke. Crack chicken is on many low carb diets like Keto and weight watchers. Rick and I have been dieting so I made crack chicken and put it over some Zucchini noodles. That was delicious. You can also use it as a dip, with chips, or even put it on bread, and over pasta. This recipe has so many options. You can also serve your crack chicken on cauliflower rice or even spinach or eat alone. We prefer zucchini noodles but it is all whatever you prefer. 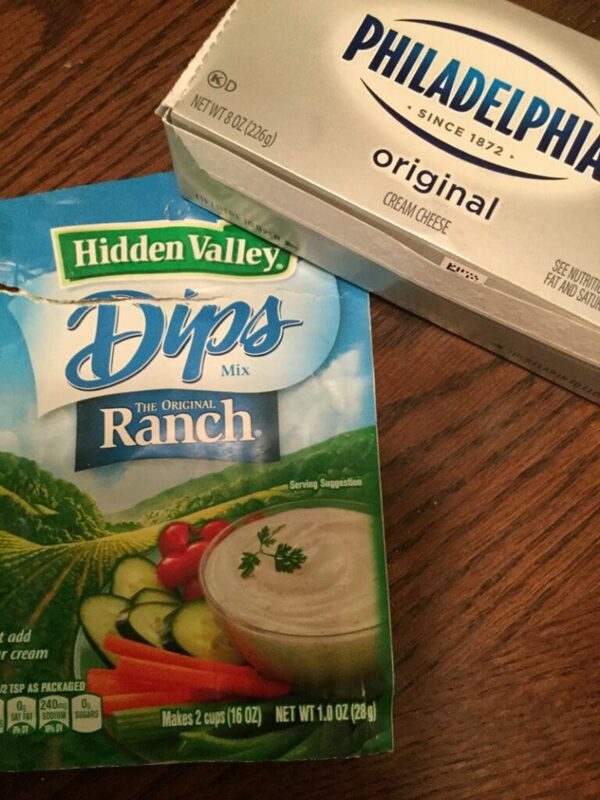 Yes, you can make homemade ranch and use that in replace of a packet of ranch if you would like. If you want to make your own Ranch you can get the recipe at By-Pink she has a great recipe for the homemade ranch. Head over here and see my slow cooker crack chicken recipe. I walk you through how to make savory and delicious crack chicken right in your slow cooker. Yes! You can use frozen chicken for your crack chicken in the Instant Pot. You will find it is the same cook time it will just take it a bit longer to come to pressure. This is one of the biggest selling points of an Instant Pot. Cooking frozen meat easily and quickly, so people who forget to sit out that frozen meat can still enjoy a home-cooked meal. Absolutely! Just allow your crack chicken to cool down a bit and place in a freezer bag or airtight container, and then freeze for up to three months. To reheat just allow your crack chicken to sit in the fridge overnight to thaw, and then toss in a pan and heat it up on the stove. You can always add some more cheese and fresh bacon crumbles to the top if you would like! Give this recipe a try today and see how you like it. I have had so many readers over the year rave over this recipe! Enjoy! What can you eat your Crack Chicken with? Try out My No Carb Garlic Bread! Crack Chicken needs a warning label it is so addicting. 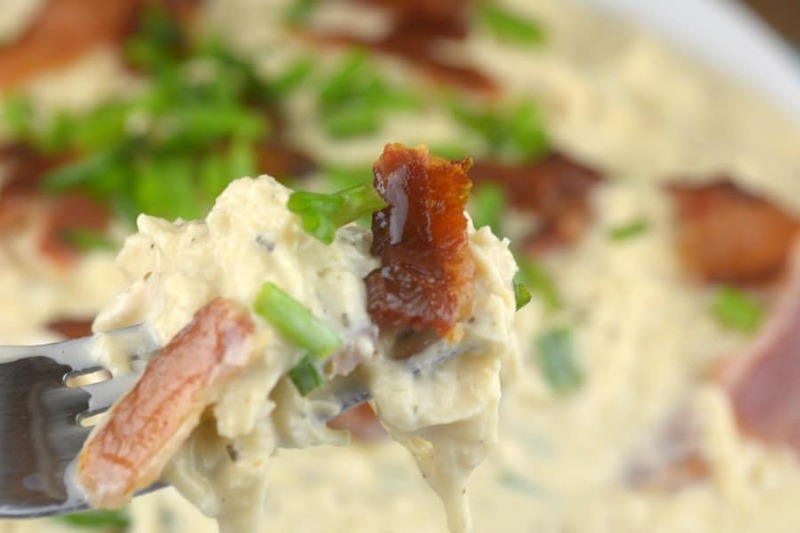 Ranch, cheese, bacon, and chicken all in one dish who could ask for more? and stir in bacon. bacon and enjoy. From what I know about the Instant Pot (pressure cooker), you would have to add water for the pit to pressurize and cook. If you added water, you would then need to add corn starch and cheese to thicken the sauce so it wasn’t too watery. In a slow cooker, you might not need to add water because the chicken will release some liquid and the food will cook with or without there being “enough” liquid. If you don’t need the water, you wouldn’t need the corn starch or extra cheese, either (although I doubt you could go wrong with extra cheese)! It’s actually kinda dry when made in the crockpot. I ended up adding milk. So I think adding some chicken broth to the instant pot would work. In the Instant Pot when I made mine, it originally was watery (immediately after doing the quick release and removing the lid). However, once I removed the chicken and shredded it… keeping the Instant Pot on low like the directions said, stirred the chicken back in, added the bacon and the cheddar cheese, it thickened right up. What I found was the cream cheese had not fully incorporated into the water until I added everything else in and stirred… once it did, it thickened quite nicely. Has anyone ever attempted to add pasta to this? I’m trying to find a chicken pasta dish to make for co workers next week… Maybe only cook 15 minutes, release, add chicken broth and pasta, and then do another7-8 minutes? I’m new to instant pot cooking. Annie, you are so fine!!! I want to try this as a pasta dish tomorrow. Did you make this yet? How much chicken broth did/will you use? Of course I tried it 🙂 this is my recipe. Someone said they were trying it with pasta and might add chicken broth to IP when adding pasta. Was just wondering if they tried it with pasta and how much chicken broth they added. Has anyone made this with low fat or fat free cream cheese? I’ve made it with low fat and it turned out the same as with the regular! What if you are using frozen chicken breast? How much more time would you add? I experienced the same thing! Because I was using frozen, I also did not initially add water (per directions) and got the “burn” message within a minute or 2 of reaching pressure. I released pressure and added a half cup of water. After 15 minutes, the chicken was still pink in the middle so I added another 12 minutes. That seemed to do the trick. I used frozen chicken and doubled the cooking time to 30 min and it came out fully cooked. Anytime a recipe’s cooking time is for thawed chicken I just double the time for frozen and it works for each recipe. Just checking, you really don’t add water to this if the chicken is frozen? I just made it with frozen chicken breast tenders. I added 10 minutes and it came out perfectly cooked. I was wondering if you have tried to freeze this and how it was once it was reheated. I made this and I was the only one who would eat it so I froze it in small portions and it was fine reheated. I also added a head of steamed broccoli because it tasted really rich and it made me feel it was healthier and it still tasted great! I tried this recipe last night. I had some chicken that needed using up so I thought I’d try something different. I thought the recipe looked ok but I really wasn’t sure how much we’d really like it, especially given that we’re not big ‘ranch’ fans. Well I’ll be… it was the best chicken I’ve ever had 🙂 If I could figure out how to remove all the calories from the cream cheese, we’d be eating this every day! Thank goodness there were some leftovers for lunch today! Did you use frozen chicken breasts or thawed? Cream cheese is low in carbs, so not bad calories. I eat low carb/ keto. Yes, this is low in carbs, but high fat. High fat=high calories. Carbs have 4 calories per gram, fat has 9. Maybe I’ll just add a little more than a cup. So no extra time or water to double? So what’s the verdict on this? Just double the food amounts, but not the water or time? Do you have any suggestions for Low Carb or LCHF side dishes or what to serve this with, without bread or rice? Thanks. I just tried this with frozen chicken breasts and one piece is still raw inside. Possibly because two of the chicken breasts were stuck together. I followed cooking instructions and 2 pieces were still pink in spots. Key thing is to not stack chicken. I had 5 breasts and two were under the cream cheese and were still pink. I’ve put them back on for 10 minutes and hopefully works and the family doesn’t get sick. I’m paranoid with chicken. trying this one tonight. used thin cut chicken. hope it turns out as good as I have heard from others. I made this with pancetta instead of regular bacon. It was good, but almost too much. We have a lot leftover, so I’m thinking I’ll mix it with rice and broccoli and more cheese to do a casserole. Giving this recipe a shot!! Can you cook the bacon with the chicken in the pot at once? I wouldn’t recommend it. I personally think the bacon needs to be crispy in this dish which it won’t be if pressure cooked. But you could cook the bacon on saute in the pot, and then deglaze it with the water… extra flavor, fewer pots! I just tried this recipe and it tasted amazing! I used the recipe exactly and served on Hawaiian rolls. It tasted great but a little soupy, consistency of an awesome dip. What can I add to thicken it up a bit more without changing much? I wanted more of a chicken salad consistancy without adding a ridiculous amount of cheese. I didn’t know if should cut the water or add something extra. Thanks! I had plain cooked chicken breasts on hand and added too more. Problem solved! LOL girl I made this recipe because it showed up in my “low carb” search on Pinterest – dumb me didn’t even CHECK the nutrition facts first! Here I am, fat and happy sitting here putting my meals into MyFitnessPal after dinner and holy crap I screwed my low carb diet with crack chicken ??? I can’t be too mad but I hope that “keto flu” doesn’t hit me too hard tomorrow! Use xanthan gum as the thickener instead of corn starch and make your own ranch mix. This could easily fit a low carb diet! If I am hoping to make this recipe in a crock pot, in less than 6hrs – more like 4hrs or less, could I cook it on a higher setting? Please advise. Also, do not add water or corn starch, when using a crock pot? I loved this recipe, as did the whole family. I ate by itself and some had as a sandwich. Loved all the flavors blended together. Definitely a keeper! Just made your chicken. YUM!! A few “things” to work around. 1-didn’t have quite enough chicken. It worked out, maybe a little two cheesy…brings be to 2-didn’t have my glasses on and thought it was 40 oz of chicken(also reading on my phone that was plugged in so I was going back and forth). I put 7oz. Too much so I’m going to make crescent roll bundles and bake!! Hi there, new to IP cooking. When you say keep IP on low, to you mean low pressure or keep warm? I use the Saute button and set it to “Less” to melt the cheese and for the cornstarch to thicken everything up. There is no cornstarch in this recipe list. Do you not use the corn starch, water, or cheese if using a crock pot? Is there a more direct crock pot recipe? This is good, but I used a little under 1.75 lbs and there’s too much sauce for my liking. I did 25 minutes which seemed to be a good amount of time. This was excellent! Thumbs up from my whole crew! Baking soda and baking powder froth up when added to liquid… I don’t mean to sound rude, but could it be possible you grabbed the wrong container? I’ve used cornstarch in IP with no problems before. Any ideas on doing a half recipe? How much time would you cook it? 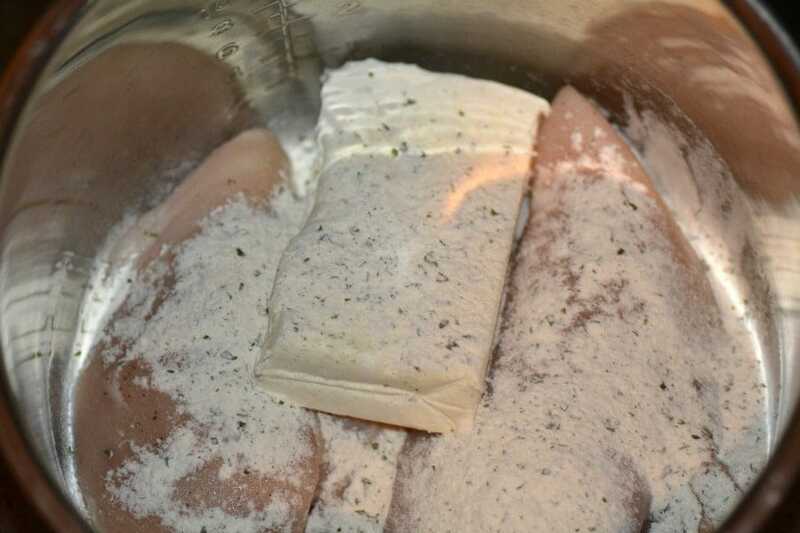 Can you give directions on how to make it with frozen chicken breasts? Did you add them raw? Second recipe I’ve made in my new instant pot. Absolutely delicious. Thank you!! Has anybody ever made this in a dairy free version? A friend is very lactose intolerant. Do the dairy free products work for this recipe? I am a very novice cook and I put this together for tonight’s dinner and let me tell you it was fantastic!!! I looked like an absolute hero to my wife and 2 year old son. The cook times were right on, the chicken was moist and delicious while we shredded it, we could’ve ate it just like that… lol thank you thank you thank you. What is the serving size and nutritional facts for this amazing recipe? The nutrition facts are listed above, but I’m curious what the serving size is as well for the nutrition listed. Thank you! New to IP, and I have all of the ingredients – except the cornstarch. Is this a musthave?? We’re stuck in the snowstorm, so definitely not heading out 🙂 Thank you! do you have the nutritional facts for this recipe? It was awesome btw! 3 tablespoons of cornstarch for thickening seems like a lot. Will the mixture be really thick? Is it suggested to use less cornstarch and how much less? 3 Tbsp of cornstarch is too much for anything. I’m going to make this but add carmelized onions and extra cheese. Probably boil some pasta to put it over. So many people are talking about this recipe and I so want to try it. Problem is I really hate the taste of Ranch anything. Is there a good substitute? 25 minutes seems very long for fresh not frozen chicken breasts is it because that is where it shredded? I normally just do 10 minutes for my chicken in the instant pot. Thanks for any feedback I think we are having this for dinner tonight. I have been seeing this all over the internet and decided to try it. I must say I am underwhelmed with the recipe as is, but it has potential. It is lacking in flavor big time. I cut my chicken up in strips and also cut the cream cheese into 4 pieces and placed spread out over the chicken, cooked for 21 minutes and it was perfectly cooked. I am still trying to figure out what this needs and so far have added hot sauce, cumin, garlic and onion powder. Those have helped somewhat, but it just needs something. Not sure that I would make it again unless I could give it a huge flavor punch. Somewhat by accident, we figured out that was it needed was some acidity to break through the thick creaminess. We put BBQ sauce on our buns when serving and it made all the difference. I’m thinking about adding a little fresh lemon (after cooking) to see if that helps. I completely agree, seemed rather bland. Relieved too see your comment as I was wondering if there was something wrong with my taste buds as so many others were thrilled. I followed the recipe exactly. I will try BBQ sauce on the bun idea. Perhaps vinaigrette coleslaw, french’s fried onions or jalapeños for toppings? Other comments were spot on. After removing the cooked chicken from the IP, the water cream cheese mixture is very watery and separated. After adding the shredded chicken back to the IP, along with cheddar cheese-a few quick stirs and it combines beautifully. The reference to shredding chicken with a Kitchen Aid was rather subtle. Shredding any type of meat by hand is such a CHORE, I did a quick Google search. OMG…how did I NOT know this trick?!?! Using a Kitchen Aid mixer with the flat paddle attachment, Stir at low speed (I used setting #2 and the chicken must be still warm for this to work). Chicken completely shredded in about a minute! Many u-tube videos demonstrating this. 5 STARS for this idea! thanks. Said you used your kitchen aid. What kind of appliance is this? I had the same question. Thank you for asking! Really enjoyed this. Followed your recipe exactly besides adding some salt and pepper and a little extra cheese. I might cut the water back some next time just so it’s a little thicker. But this is definitely going in our rotation! Chicken came out perfectly cooked, easy to shred and juicy. Could you try this with another meat? Made it & am obsessed! So good! But just wondering if it’s been tried with other meat. Do you have the nutritional valve? How many servings and WW points? I’m on the fence with this one. While it is super easy to make, it’s also really cheesy. My husband isn’t a huge cheese fan but he ate it anyway. I like cheese and still found it cheesy. He wants me to make it with mayonnaise instead of cream cheese. Maybe. It is a very tasty dish, nonetheless! So I have the instant pot lux 60 and it has an adjust button but I can not get them to adjust to a low cook…I got all the way to putting all the ingredients back in and cooking for another 15 on low…and couldn’t get it to cook on low, so just put back in on high for 5 minutes. New user to this ip still and even trying to read the manual, and watching you tube videos, I was frustrated and hope I dont over cook the chicken using it the way I had to. Wish me luck! It looks amazing! I made this the other day, used the recipe to the T! Came out yummy but it was VERY salty. Not sure why. I didn’t add any extra salt. I made this for dinner tonight. It was a big hit. I followed the recipe and made no tweaks. Thanks for the recipe. This recipe was a huge hit at my house with a few major changes. I used 2 lbs boneless skinless chicken thighs, not frozen. I ran the pot for the first 15 minutes, and chix was barely cooked. Ran it for an additional 10 mins and the thighs were perfect. The brick of cream cheese did not want to incorporate into the liquid well, so I whisked and whisked just to get it to break down. And there was a ton of liquid. I decided to mix this into pasta, so I precooked al dente rigitoni, and after pulling out the chix to shred and whisking the liquid, I added the pasta to finish cooking in the extra liquid on saute function. I then added the cheese, chix, and bacon back to the pot until it was heated through and placed on warm to serve. This is a very delicious dish, but needs tweaking to achieve serving the chix on its own. What would be some good sides to eat with this dish? Made this tonight- everyone loved it (including my 17 month old!). I wonder how it would taste with the addition of jalapeños, or maybe artichoke hearts? Also, has anyone tried it with low fat cream cheese? I served it with a light Greek salad- shredded romaine lettuce, celery chopped thin, chives, sliced green olives and a Greek vinaigrette that had some feta in it. It felt nice and light next to this heavy but delicious dish. Yum! Was very creamy, so some liked, some didnt. I loved it! Sauce looked watery when i first opened up, but after adding back shredded chicken and cheese, it creamed up nicely. I used half frozen chicken breasts. Do you think could sub turkey bacon? Don’t eat pork. I don’t eat pork either, but I made it without bacon and it still tastes really good. I usu use chicken broth in place of water too. Maybe should have trusted my instincts? I read not to put dairy in an IP, to add it t in after. Was going to leave the cream cheese until after – put it in anyway. Now I’m getting a “burn” display? Every time I make this I add the cream cheese in while cooking. This looks and sounds decadent. I think the carb count is a bit off considering the ranch packet alone is at least 16g. But even if it’s 6 or so grams each, it’s definitely something I’ll have to try… thanks for the recipe!!! 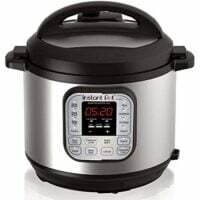 What if your using the instant pot multi cooker, what setting could you put it on and it turn out good? How many servings is this recipes? My kids LOVE this so much! How much water would you use to double this recipe? I made this tonight using Italian dressing mix and it was delicious! Thanks for a great, easy recipe! My daughter said that the cream cheese curdle in hers. Can you add the cream cheese last and let it melt into everything else at the end? Would it be possible to leave out the water? Mine turned out very soupy in my instant pot. I do not have an IP but will be making this in my crock pot. Do I NOT add the water and corn starch when using a crock pot? This recipe has everything in it that I love and I can’t wait to try it!! Thanks!! Oh. My. Sweet. Lord. This recipe is amazing!! I served ours over Jasmine rice. Thanks for sharing!! Made this for dinner last night. My table has never been so quiet!! My family LOVED it!! I cooked some bowtie pasta (about half a box) on the stove and added it when the chicken was done. Next time I may leave out the pasta and try it on Hawaiian rolls, like a chicken salad. Cant wait to try more of you recipes!! I made this in an 8qt and it gave a burn notice as soon as it reached pressure. Then I released, scraped the bottom and tried on low pressure and it did the same thing. Wondering if I needed more water due to the bigger pot? Hummm not sure what happened I used an 8qt also with that 1/2 cup water. I wanted to throw something out there for you. I seen this an immediately wanted to try it, however, my family only eats cream cheese when it is in my chicken Alfredo that they love! So, in an attempt to do around the same thing I used this recipe with Italian seasoning (Not the dressing packet, but a general mix of Italian seasonings) instead of ranch, added pepper and added grated Parmesan cheese, then replaced the water with one box of chicken broth. To die for! I had trouble finding a way to make my Alfredo in the IP without burning it, but this helped so much! Thank you! Looks amazing but some of my family dislikes ranch. What could I sub in its place? Good Seasons Italian dressing or Onion soup mix. I put all the ingredients into my carb manager app and it says there are 8 carbs in each serving ? how are you getting 2 carbs? I must’ve done something wrong.. I got the same thing! No idea how they came up with 2g carbs. Also wish they would post how much a serving is. I have 4lbs of chicken, should I double the other ingredients?? Uh-mazing results. Used frozen chicken thighs and a bit more shredded cheese, let it sit on “warm” in the Instant Pot for 5 minutes – definitely not watery at all. It had significantly thickened up, well past the consistency of chicken salad and well into “frickin delicious chicken paste” realm. Used some Kings Hawaiian rolls and they were awesome, filling, sliders. Husband looked at me quite concerned and said “I’m afraid…the name of the chicken you made was accurate. *scratches chest, twitches* Got any more of that crack chicken?” lol It is now in the #WillMakeAgain rotation. Thank you! I used frozen chicken and it doesn’t take the same amount of time like the recipe suggest. I originally put it on for 17 mins and it wasn’t done, so I cooked it an additional 5 or 6 mins. I ate it over pasta and with broccoli and it was good. I definitely wouldn’t call it “crack chicken”. What’s the actual serving size?? Could you clarify the Crack chicken recipe if made in a crock pot and not the Instant Pot….the end of the recipe says to add bacon, bacon. Do I add the 1/2 c. water? Did you mean add bacon and cheddar cheese? This will not work in my Instant Pot (Pressure Cooker mode) as it has too little liquid. I tried a similar recipe and the IP gave the BURN message, then will no longer go into Pressure Cooker mode once you get the BURN message. Not that happy with my Instant Pot. Seems like Pressure Cooker Mode requires too much liquid, then the final product is very, very soupy and bland. I can only cook these type of recipes in the slow cook mode. But I think everyone’s IP is different. How can you pressurize with only 1/2 cup liquid? I made this but used chicken already cooked that I needed to use. I decreased the time because of this, and shredded the chicken in the pot. Once I stirred the cheese into the mixture, it didn’t need anything to thicken it. I think it needs the water to pressurize. Hi! I just tried this! YUMMY!! I made it with Honeysuckle turkey cutlets! I served it with cauliflower rice. Very Keto friendly! Can this be done without an instant pot and if so what would the receipe and instructions be? I don’t have that pot but have crock pot! How long would I cook in crock pot?? How much is in a svg? Cup? OZ’s? Delicious. Will definitely be making this again! Hi. I am new to Instant pot cooking. I thought it was required to have a minimum of 1.5 cups of water to use it? I have the 8 quart model. What size is this recipe meant for? What will happen if I only use a half cup as indicated? Thanks, in advance. This was very good! I used 1 cup of water, light cream cheese, and 5 pieces of bacon. I ate it with rice and steamed broccoli. This recipe is a keeper! Thanks for sharing! what does crack mean? Crack chicken or crack brownies, or crack pie or crack beef recipes. What the heck is the meaning of the word crack in this context? I’m goimg bonkers trying to figure it out. Just made this recipe- left out the water, and OMG it’s deliciuos! Now I have enough to put with broccoli, or on a salad, over quinoa, or with Parmesan crisps!! I separated some and added franks red hot sauce too!! Amazing!! How long to cook if doubling the recipe? This was very good. However, is there a way to reduce the salt? I dont have a IP and I want to make it in my crock pot… I’ve noticed questions regarding this that haven’t been answered… so, I thought I’d try my luck in asking… any advice on doing this in a crock pot? Having a party, can this recipe be doubled in IP or crockpot and just double all ingredients? I just made this recipe for the second time and doubled the ingredients. For anyone asking, we kept the water amount the same (we used broth) and requires no additional cooking time. We used a 6qt Instant Pot, and it was fine. I don’t know what the cup servings would be, but we found that a serving is about 300 grams. Also, we love the recipe! WARNING: this is not Weight Watchers friendly. I’m on Weight Watchers and this popped up as being ‘Weight Watchers friendly’ but that couldn’t be further from the truth. Lol. But I still made it and tried to cut out as much cheese as I could without compromising taste. I added a little at a time so I have no idea how much I ended up adding, but it wasn’t as much as the recipe called for. I’m a sucker for cream cheese (part of the reason I ended up on Weight Watchers…haha), so of course I thought it was good. If you’re on any type of diet, check out the nutrition facts first. Delicious even if it isn’t Weight Watchers friendly! Two questions…. what is the serving size? and what are the Weight Watchers points? This was ahhhhhhhmazing!!!!! Family favorite! Can’t wait to make it again! This doesn’t make rubber chicken? I’ve had no luck with breasts in the IP. Hi! I’m hoping to make this for a group of thirty. What is the max amount to make per instant pot? I have 3. Please help!! I’m just wondering if over half the commenters even read the recipe….Step #6 clearly states crockpot instructions, which don’t include water. And the top of the recipe clearly states 4 servings. How much is considered a serving for the 2 carbs? I’ve made this twice now in my IP. Both times it was very good, but my wife and I felt the whole packet of ranch seasoning made it much too salty. Hidden Valley seems to have cornered the marker on ranch seasoning, so I couldn’t find a low sodium alternative. The second time I just used about a half a packet and it was much more sodium tolerable. Both times we had to cook the chicken an extra 5 mins as it was a tad pink in the middle. I think 1/2 cup of water is a little too much, but adding a little more cheddar cheese thickens it up. I also added a little grated parmesan as well. Also, cut up some green onions and add it to your bowl for a great topping. Thanks for a great recipe! Can you add the bacon in raw the chicken breasts so you don’t have to cook them separately? I’m new to this. I’m interested in adding broccoli to this, and it would be frozen. Should I adjust anything? Just got my IP yesterday so I’m a brand newbie! Thanks in advance! How much is a serving and how are there only 2 carbs? When I put it into my recipe maker there are 7.9g net carbs per serving for 6 servings. How would I do this in a crockpot, I don’t have an instant pot. Thank you. My husband made this while I was at work. The flavors were great, but I found the texture of the chicken to be a bit too chewy. Have you had that happen? Did we cook too long or not enough? This is so good and super simple! My 5 year old made this last night in the IP! Only thing I did differently was a 10minute natural release to keep the chicken moist. It’s so good! Made this tonight. Didn’t have ranch dressing so we used an Italian dip mix I bought at a craft fair. It was amazing and we served it over spaghetti squash. Will definitely be made again! Easy and flavorful, just what the doc ordered! Could I use ranch dressing? I don’t have any ranch packets! HI! I also noticed on the crock pot version you had 2 packets of ranch seasoning? Is there a reason you need more in the crock pot vs. the instapot? I’m afraid of cooking the cream cheese for 4-6 hours? Would it be okay to cook the chicken in broth, shred the day before then add the cream cheese and ranch the next day? Sorry, never made it before and planning on making it for a party on Sunday! While the price of chicken has gone up a bit, it’s still a great value for people who like meat in their diet. The beauty of recipes like the Crack Chicken is that it shows how many different things you can do with chicken. It also shows how easy it is to whip up a delicious meal in the Instapot. Thanks for sharing the recipe AND the variations. Anyone intetested in knowing how many WW points one serving is? The recipe is for 4 people. I made this tonight as my second IP meal :^D it was delicious and my boyfriend raved about it for hours afterward!!! I wondered at first if I should put the chicken on the trivet, but no…. just set it directly in there (as stated in the directions) and no burn notice or anything! Definitely keeping this recipe for future meals. This was delicious and my family loved it! I have a 9 and 11 year old. They both want me to add it to our dinner rotation. I used frozen thin cutlets. Since they were frozen, I did not add water but I got the burn signal. I opened the pot, scraped the bottom, and added 1/4 cup of water. I was worrried that the sauce would become soupy but it didn’t. I made the mistake of adding salt at the end. It did not need it and made the dish really salty. So please taste test before adding salt. This a a keeper. Thanks!!!! The recipe sounds delicious, but I absolutely hate it when they call a recipe “crack”! They need to come up with something else!! But will be making the dish!! I have tried to find the recipe for Crack Chicken but all I get is other things and not the recipe. How do I find your recipes? In the crack chicken recipe, Step 6, what do you mean by “keep your IP on low”? I made this tonight following the recipe exactly. It was sooooo salty that it actually was inedible and I usually love salty foods. I had not added any salt separately. I asked my daughter to taste and she felt the same way, so I ended up throwing it out. I might try again with 1/2 the packet of ranch. I’ve also seen some other recipes that call for adding garlic and onion powder so that might help with the saltiness. Made this yesterday. It was awesome. Instead of using half a cup of water I used one can diced tomatoes with green chiles. The liquid in the can was just the right amount. I cut my chicken horizontally in half so that it would be thinner and cook thoroughly. After the time is up and it sits for 5 to 10 minutes it thickened up nicely will definitely make again.